"There's nothing out there except dust and ruins…" Watch out for angry wild boars! Australia has given us many various wild and crazy creature features, and we have yet another one on the release line-up for 2018. Boar is a movie directed by Australian filmmaker Chris Sun about a massive, dangerous, angry wild boar. "It cares for none, defends its territory with brutal force, and kills with a raw, animalistic savagery unlike any have seen before." Yeah, just one massive, vicious, wild boar. 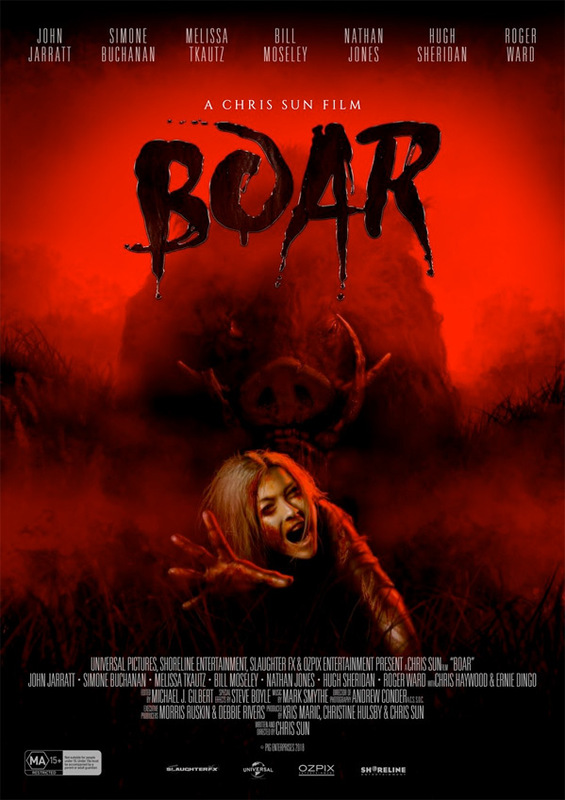 The cast of Boar includes John Jarratt, Simone Buchanan, Bill Moseley, Melissa Tkautz, Nathan Jones, Roger Ward, Hugh Sheridan, Ernie Dingo, Chris Haywood, Ricci Guarnaccio, Emily Williams, and Steve Bisley. This looks like it gets very violent and very bloody, which is exactly what we should expect from Australian creature horror. In the harsh, yet beautiful Australian outback lives a beast, an animal of staggering size, with a ruthless, driving need for blood and destruction. It cares for none, defends its territory with brutal force, and kills with a raw, animalistic savagery unlike any have seen before. Believed nothing more than a myth, a legend brought to life by a drunken local, the beast ventures closer to civilization, closer to life, and ultimately, closer to death. It's brutal, it's bloodthirsty, it's boar. Boar is directed by Australian filmmaker Christopher L. Sun, or Chris Sun, of the films Come and Get Me, Daddy's Little Girl, and Charlie's Farm previously. The screenplay is written by Chris Sun, with Kirsty Dallas. The horror film is set for a release in Australia this October, on Halloween, but has no official US release yet. Stay tuned for updates. Who's in?